HALO products provide next generation, low power, real-time, video processing at the source for image-based surveillance in defence and security and industrial applications. Furthermore, HALO-based products are not restricted by American ITAR export regulations as they are designed and manufactured in the UK. This means that they can be used anywhere in the world. Newport, Isle of Wight, UK - RFEL, who specialises in high performance, electronic video and signal processing solutions, has signed Plextek Consulting as its first strategic partner for its HALO™ video-processing platform. Plextek is a specialist in product and systems design for communications, aerospace, defence, automotive and medical applications. "HALO is an extremely powerful and flexible platform for creating video-processing solutions," explained Alex Kuhrt, RFEL's CEO. "We are now starting to build an ecosystem that will bring together companies with complementary skills to create innovative solutions. The HALO platform provides a proven set of hardware and software for video processing that companies can build on with their own specialist skills. This saves them from having to re-invent the wheel and thus provides a faster time to market for their products." Dr Paul Martin, Chief Technology Officer at Plextek, added, "We are very excited about this partnership as it will enable us to fast track video solutions for our customers based on RFEL's innovative HALO platform. We are particularly impressed by HALO's high throughput performance that has remarkably small power consumption. This opens up many new applications as it enables compact, lightweight solutions to be created, as no cooling fans are required." HALO delivers powerful, real time, video processing; even when operating in the most demanding of visual environments. 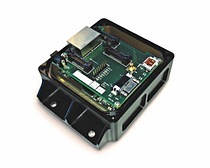 HALO™ products enable high performance and smart intelligent video processing and analytics right at the source and remove the requirement of power-hungry, central processing in vehicles, UAVs or other sensor-carriers. Available in three standard form factors, the core image conditioning features of HALO provide image enhancement, while also significantly reducing the data load on the network. Furthermore, the HALO™ platform readily supports the integration of client firmware and software to achieve a strongly integrated and maximally efficient solution. Ruggedly housed sub-system that realises the HALO™ processing solution in a small form factor (137mm x 105mm x 80mm). It is suitable for qualification to military environmental standards and offers direct connections to standard video interfaces and host control interfaces. The connectors are MIL-DTL-38999 III series as standard, but customer specified connector technologies can optionally be incorporated, including commercial or industrial standards. The PCI Express-based, XMC form factor board to integrate in system electronic compartments, which offers direct connections to standard video interfaces in addition to high throughput host control interfaces. It can be customised to specified interface requirements, and is available in a variety of ruggedness levels. It is suitable for use in any high performance video system, and can offer a road map to very high performance capability, or as a turn-key obsolescence management or retro-fit solution. The tiny (90mmx75mm) System-on-Module board, equipped with an all-digital high density connector to implement directly into sensor housings. This is a mezzanine (or 'daughterboard') small processor board which offers circuit-level connections to the HALO™ processing system's internal digital video and host control interfaces. It requires a host carrier board to provide external video interfacing, e.g. video decode or other adaptor chip-sets. It can be customised to customer specific connector requirements. It brings the power of the HALO™ solution to products with private or very constrained form-factors and external interfaces. It can also accelerate the adoption of RFEL image processing IP to existing product designs by offering a plug-in solution. User designs, in FPGA and/or software domains, can be integrated into the system with ease. FPGA video data frameworks, using AXI based interfacing and documented APIs and drivers, along with a fast integration work-flow, make accessing the power of HALO™ a quick and easy proposition for developers wishing to incorporate their own IP. Since Linux is a key enabling technology of IQFabric, product developers can also take advantage of the Linux eco-system of applications, network enabled capabilities, security and ruggedness that this widely used operating system provides. All HALO™ products have a range of built-in IP-blocks: video input switch, test pattern generator, video output switch, software frame grab, digital zoom and digital overlay. Intelligent fusion of multi-modal imagery, such as from daylight and IR cameras. Image stabilisation, even when the platform is subject to severe vibration, and when the imagery is sparse in features or of low contrast. Contrast enhancement to maintain high performance operation in marginal lighting conditions for both visible and IR wavebands. Noise reduction for optimising operation in low ambient light and for ensuring robust image fusion. Plextek is one of the largest independent electronics design consultancies in Europe. The company provides design services to the communications, defence, automotive, industrial, scientific and medical markets, and also design and supply clients' own electronic products. RFEL Ltd is a UK-based innovative electronic systems designer, providing real-time high specification signal, image and video processing products, FPGA solutions and design services to defence, security, communications and instrumentation markets.